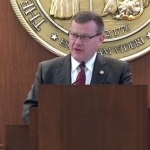 In case you missed it this morning, journalist Colin Campbell of The Insider has a good piece in this morning’ News & Observer about the problems arising from House Speaker Tim Moore’s far flung law practice. As Campbell points out, it raises serious ethical issues when a powerful politician represents multiple private and public clients on the side. The body operating the state government, the GOP, seems to have little ethics; why should anyone be surprised here? He also represents business at the North Carolina Industrial Commission. The legislature push to crack down on small business for workers comp issues. Then he represents the business at the NCIC hearings.